Small, filthy hands trembled as they grasped the knife. A hundred Angmarim surrounded him, watching. Pulse racing, he looked up at the dark, scarred face of his father. Ge’bar turned his pallid face back to look at the young Hill-men fighter who had been beaten for a good portion of the previous night. He wanted to ask the man’s name. He wanted to ask his father why he forced him to kill a prisoner every week. But the last time he had asked he had been beaten and physically forced to slit the prisoner’s throat. It had been a woman that time. Most times it had been men, which made the killing a little easier, though he didn’t know why. Ge’bar didn’t like that the killing had gotten easier, but as he met the blood-shot eyes of the man who couldn’t be more than twenty, Ge’bar plunged the dagger into the man’s chest, feeling numb as blood poured out over his hands. The sight and feel of the warm, sticky liquid made him feel sick. Red — everything was blood red, a murky, poisonous green, or grey with death and decay. His father wore red, as did he, and nearly every other man in Fasach-falroid. Warg’s growled and gnashed their teeth a hundred yards away, the sound making his little nine year-old heart thrash within its cage. Orcs lumbered around in their midst, snarling their dark speech, anger and hate filling every essence of their being. Ge’bar’s greatest fear was that he would be turned into one one day. He could no longer look at his reflection, for lately he could hardly recognize his own face. Looking back up to search his fathers face he wondered if any of them were much different. A cruel smile spread across Garduun’s face. “The enemy are everywhere, my boy. They think the land is theirs, but not for long. Our great lord will consume them and rule as he did in the days of old. When he returns north he will find that the Free-people who opposed him will be no more.” A cry rose from the surrounding Angmarim and orcs, spears and swords thrusting into the air. “Back to your camps, the lot of ya!” Garduun shouted in command. “We have Hill-men and Elves to kill tomorrow!” The soldiers shouted with excitement and turned to ready their own men for the battle. Yes, they had been winning against the hill-people for as long as Ge’bar could remember, up until several months ago when two elves had arrived with a company of Rangers. He wondered what an elf was. He had seen a Ranger before, but never an elf. Garduun had told him that Elves were a race from across the great Western Sea that despised everyone. Behind their beautiful faces were demons of light, though Ge’bar never understood what was wrong with light, nor did his nine year-old mind grasp the concept of beauty. Elves let the trees grow tall and wasted the land that could have been torn up to build on. They thought they were better than everyone else, and above all, elves wanted the Witch-king dead. Ge’bar could not help but shudder visibly as he cleaned off his knife. He did not know if he liked that idea or not. For almost a year Garduun brought his son with him into battle. If Ge’bar lived, then he was considered to possibly be worthy of serving the Witch-King. In the event of his death, though, he knew his father would not care, convinced that Ge’bar’s death meant the boy could have never amounted to anything. For months he had wanted to die. If life everywhere was like here, he did not want to live it. The few small things that brought him joy confused him more than encouraged him. He did not understand the emotion aside from the joy in his father’s face after killing. “Do you think she will be there?” Ge’bar asked as he slid his blade back into its leather sheath, careful to darken his tone so as to hide his curiosity. “I — I should like to do it, father, if we can find her,” said Ge’bar. He turned his head down to hide his eyes, afraid that the two dry orbs would betray him. Humphing, Garduun studied the child before nodding with approval, some faint hint of a smile crossing his twisted features. Ge’bar followed his father back into the circle of tents, leaving the dead man’s body behind for the wargs to devour. He got a double portion of food that night for the execution. Laying down on his pallet, Ge’bar fell asleep to the sound of growls and screeches, thinking that it might not be so bad to die at the hands of an elf. The weather in south-west Angmar was the fairest Eruviel had ever seen in that land. Streaks of bright blue sky peeked through the tumultuous red clouds as a warm southern wind stirred up dust and ash from the valley floor. Fitting a new string onto her bow, the elf maiden strode down the hill to the northern gate of Aughaire where hundreds of armoured hill-men and Rangers gathered. “Lle desiel, oselle?” Milloth’s voice floated into her ear as he stopped beside her as he counted the arrows in his quiver. “I am always ready, dear brother,” Eruviel responded as she smirked up at him. She finished fastening a blade crafted by her brother to the tip and back curve of her bow. With his golden hair pulled taunt into a tail behind his head, one could see they were related by their merry, green eyes, and their bright, sincere smiles. When she had been a child she envied Milloth his Vanyar traits inherited from their mother, one of them being his golden hair. Now she teased him that he made himself a greater target. Relatively short for an Eldar, standing at five-foot-ten Eruviel delighted in her ability to vanish into shadows and meld into the crowd of hooded men. The Noldor lord towered over Eruviel by more than a foot, and this morning he grinned at her like she were a child. “You look fair today, Eruraviel. You still retain all the grace of your youth,” Milloth said, chuckling affectionately. “I do not know how you manage it in a place like this. For some reason I am reminded of our first hunt,” he said as he brushed her rich brown braid off her shoulder. The Ranger Cade stopped by Eruviel’s other side, wordlessly nodding to her as their eyes met for a moment. He then handed her a small bundle of laced arrows. “Light and fire oil, brother,” she explained, catching Milloth’s curious look. Slipping the projectiles into a smaller, secondary quiver strapped to her back she moved in step with Milloth and the others as they began to march down the hill. “Cover the left flank!” came the orders amidst the roar of battle. Not wasting time to respond, Eruviel wrenched her blade out of an Angmarim High Priest and dashed north to answer the command. She moved freely amid the ranks, aiding where ever help was needed. The wind had picked up, swirling clouds of grey dust through the lines of warring soldiers. Her long, dark lashes protected her eyes from the dirt as she dodged thrown implements and shot down wargs in her path. The enemies of the Free-People had grown strong, but thanks to Milloth’s foresight their lines had held and a change in tact kept losses to a minimum. Arriving on the far left side of their lines, Eruviel loosed a volley of laced arrows into the enemy as they ran forward to meet the fierce blades of the hill-men. As the last Angmarim fell she turned to rejoin Aloeer and Cade at the front when a strange cry carried across the field. The sound brought her heart into her throat. It came again, louder, clearer. “By the Valar,” she spat, cursing under her breath as she shot forward. If her features were not hardened enough from battle, her eyes now gleamed, blazing a cold fire from under her smokey green hood. All sound faded from her ears except for the frightening cry. Weaving across the battlefield she bounded atop the impaled body of an orc and leaped over the front lines. Ignoring the alarmed shouts from behind her, Eruviel sprinted up a slab of rock and vaulted high into the air. Drawing her bow in-motion she saw a small boy curled up on the ground at the base of the large stone. Loosing three arrows into the advancing enemy she dropped to the ground, putting herself between the injured child and the dozen Angmarim and orcs. 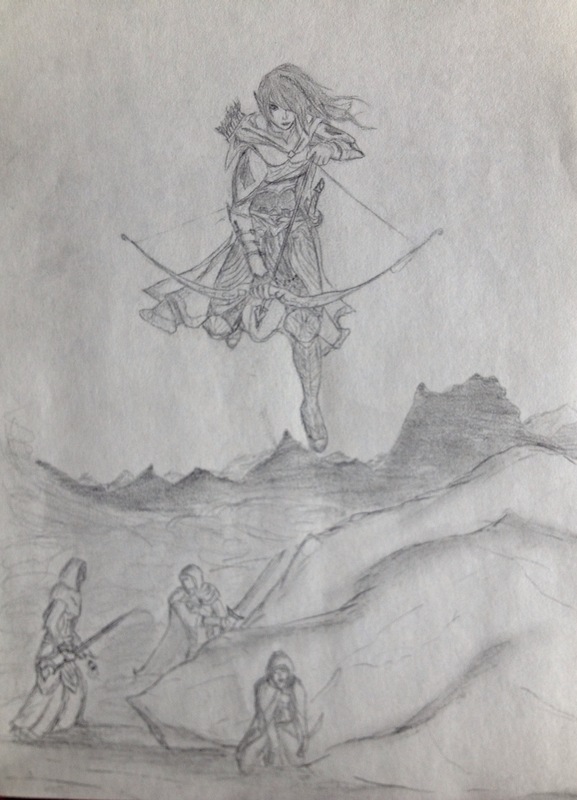 Raising herself up to her full height, she threw off her hood and released her last two arrows, downing two of the dozen before they could react to attack her. Unsheathing her sword she wielded it in one hand, using the bladed end of her bow as an off-hand spear. Letting out a terrifying cry of pent-up energy and rage, Eruviel spun into the first attackers, hacking down the ten with unnatural ease, and turned to greet more of the enemy. How dare they, she fumed. She ignored the child’s blood-red robes and the long black knife he clutched. The monsters! Another wave of enemy drew within her reach. Eruviel forgot herself as she danced through the orcs and Angmarim that surrounded her. Slicing through their numbers she turned off her thoughts, not liking the dark analogies her mind made in the heat of battle. Black mud — not dust clung to the bottom of her boots as she whirled from one foe to the next. The only graces she allowed herself were to glance back to the boy, making sure he still lived. A wicked, garbled voice cried out as the Angmarim leader of Fasach-falroid rushed her from behind. Thrusting her sword into the head of a warg she pivoted around, ripping one of her arrows from a fallen foe, and, whispering a blessing to ignite the light-oil, pierced the corrupt man in the heart. It was only then that Eruviel realized that there were no more foes attacking her. Hill-men and Rangers ran around her and the scattered mounds of her quarry. The Angmarim had finally been routed. Turning back towards the boy she saw that he still laid on the ground one hand grasping his black blade, the other clutching his leg. The blade wavered as the child turned to point it at Milloth who approached from the side, Cade following close behind. Eruviel intercepted her brother, putting a hand firmly on his chest to stop his progression. “No, Milloth. Leave him be,” she said quietly. “You will suffer me this, brother,” she replied, her voice alarmingly fierce. Searching her face for a moment, Milloth nodded, relenting. Giving her shoulder a squeeze, he turned to rejoin the main force. Meeting Cade’s gaze that was all shock and admiration, the man gave her a small smile and a curt nod before turning to guard her back. Eruviel’s eyes flickered over the landscape before they finally settled back on the boy. The child could not have been older than ten, though he looked half that age. Shaggy, dirty brown hair fell over his amber eyes. Eruviel noted that they were not dilated, nor were they blood-shot, though he stared at her openly with a fearful awe. Filthy and half starved, the boy looked to her like any other child would have if trapped in a nightmare. His knife was now aimed at her, though his arms shook more now than before. “Please, kill me.” His trembling words sounded through parched lips. The boy frowned, his still-wide eyes filling with tears. “I am a servant of the Witch King who rules these lands. This is all the world is . . . e-except for you. P-please, I don’t want to go where you have sent my father.” The child glanced past her to the fallen Angmarim Captain. Eruviel let out a sharp breath. The moisture that had gathered in the corners of her eyes reflected light from the partially cleared sky. “Little one, I will not kill you,” she said softly, all of the usual warmth of her voice returned. Slowly extending out her arms, she gingerly closed her palms over the knife’s hilt, unnerved by how cold the boy’s hands were. He let her take the blade, and his arms fell limp at his sides. “B-but, I will be fed to the wargs if I return,” he whimpered fearfully. His eyes stared up at her, tears pouring down his filthy face. “They call you the Lady of Mercy. I beg you. I-I think . . . maybe if I let you kill me . . . maybe your demo- your gods of light will listen to you.” He clawed at the rock behind him, pulling himself up in spite of what Eruviel suspected to be a broken leg. “You don’t think I deserve it?” the child managed as he sobbed, his eyes flashing with a familiar fury. “I can kill just as well as you, b-but I’ve killed your p-people, not m-mine. Lots of them!” The boy choked on his words as he struggled for breath, his angry attempt to clear his eyes of hot tears failing. “Ge’bar,” said the boy, his face twisted with confusion as he watched her clean the blood from her sword off on his cloak. “Hmm,” she exhaled, sniffing to keep her own tears in check. Sheathing her sword she tossed the soiled cloth over her shoulder. “We shall have to find you a new name,” she said, smiling kindly at Ge’bar. “I am responsible for you now. Do you understand this?” Eruviel asked seriously. Ge’bar looked over to Cade who still stood guard several feet away. “Yes. I understand,” he said, the glimmer of hope in his eyes sucking the air from Eruviel’s lungs. He glanced at her sword almost hungrily. Ge’bar hesitated drawing back for a moment before nodding his consent. Careful not to cause undo pain to the boy, she lifted him in her arms, her left forearm bracing his broken limb well enough so that she could run. It took a minute for the boy to relax, as if he had not been carried since before the time of memory. Cade ran before them to ensure her safe passage, occasionally picking off a straggling enemy. “After . . . after you heal my leg, then will you . . . ?” asked Ge’bar as he began to relax, drawing closer to her as she bore him across the barren field.